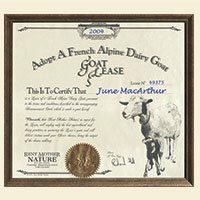 The lease document entitles your gift recipient to fresh goat cheese that is produced from the milk of their very own ‘French Alpine’ Goat. The cheese will be shipped directly to their door when they want it. Progress Reports will keep your recipients up-to-date about life at the goat farm. We do all the work and you get all the raves (while helping support America’s family farms). A small family farm in the Berkshires, dedicated to the principles of sustainable agriculture, produces this artisanal cheese. Absolutely no preservatives, stabilizers, artificial ingredients, or additives of any kind are ever used. These products will enhance your gift. Buy a basket and get a free photo. Experience the warmth, comfort, and durability of a natural wool blanket from the wool of a flock that includes your own Dorset sheep, a beloved member of a shepherd’s cooperative. It all starts with the tender care we take of the sheep of your choice. Sheep are first sheared in April (they get a second shearing if their fleece gets too long). The pure virgin wool, nature’s premier fiber, is carefully washed -without the use of solvents, bleaches, moth-proofing or harsh chemicals- by skilled weavers.The wool is then carded, spun, woven, and napped into natural, custom-woven blankets. An heirloom that will be appreciated and enjoyed for generations. 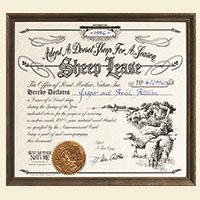 Our three progress reports will keep your recipient up-to-date on the tender care of their sheep, connecting them to the land and the flock. We do all the work and you get all the raves (while helping support America’s small family farms and craftsmen). Treat a friend (or newlyweds) to the warmth and comfort of a natural, organic blanket made from their own sheep’s wool. After your gift recipient’s sheep is sheared the wool is rushed to the mill to be custom-woven into a pure, virgin wool blanket -made as nature intended with no compromise on quality, and without the use of any dyes or chemicals. The perfectly natural way to stay warm. On a picture-perfect Vermont hillside, complete with red barns and a 150-year-old stone farmhouse, a small family farm makes the finest farmstead cheddar cheese, just for you and your gift recipient! Our cows are fed only fresh hay, grain, and pasturage since any cheese is only as good as the milk that goes into it. No BST or other chemicals are ever used. The high butterfat content of the milk from your pampered toast-colored, soft-eyed, long-lashed Jersey cow ensures a rich, smooth cheese. Progress Reports will tell recipients about the fine art of cheese-making, farm life, and all the moos that’s fit to print about the herd. And, if you like, we can take a photo of their cow to add to the family album! Surprise someone with the rental of a Vermont dairy cow for superior cheddar cheese from an animal they will be on a first-name basis with. The high butterfat content of the milk from their pampered toast-colored, soft-eyed, long-lashed Jersey cow ensures delivery of a rich, smooth, hand-made cheese.